Col. Gen. Sergey Rudskoy, Chief of the Main Operational Directorate of the Russian General Staff, commented on the situation in Raqqa, Syria and Eastern Ghouta. The native Arab population began an uprising against US-controlled units in the suburbs of the Syrian city of Raqqa, the Chief of the General Staff Sergei Rudskoy said. "The command of the Syrian Democratic Forces and local governments, appointed by the Americans, do not cope with the need to resolve humanitarian problems. The native Arab population is subjected to repression and punishment, forced mobilization is being carried out. This causes sharp discontent among local residents," he said. 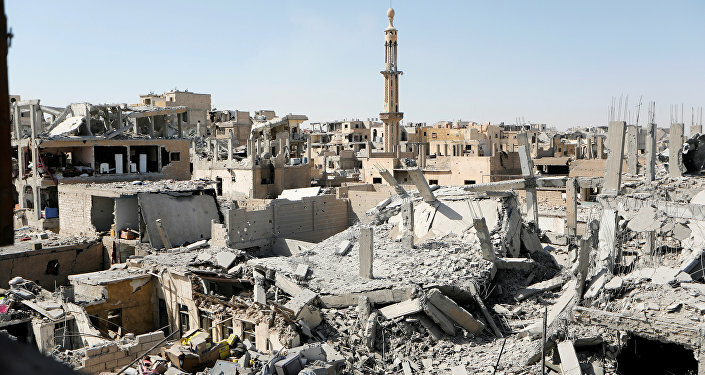 The infrastructure of Raqqa, Syria, where nearly 95 thousand people have returned, is completely destroyed, according Sergei Rudskoy. "According to the UN Office for the Coordination of Humanitarian Affairs, a disastrous humanitarian crisis has developed in Raqqa," Rudskoy said. He noted that because the water main isn't working, there are serious problems with water supplies. Water is often taken directly from the Euphrates, which increases the threat of the spread of infections and epidemics. Raqqa was taken over by the terrorist group Daesh* in 2013, which went on to declare it the capital of their self-proclaimed caliphate in 2014. In late 2016, the Syrian Democratic Forces (SDF), with the support of the US-led coalition, started an operation aimed at freeing the city from the militants' grasp. In October 2017, the SDF announced the full liberation of the city, which was later confirmed by the US-led coalition. More than 44,000 people left the suburban Damascus region of Eastern Ghouta through the humanitarian corridors, Col. Gen. Sergei Rudskoy said. "Today one can say that the situation in Eastern Ghouta has radically changed. Right now you are witnessing a humanitarian operation on a unique scale. Today alone, 26,610 civilians have left [Eastern Ghouta] through the humanitarian corridor, while the total number of people, who've left Eastern Ghouta has reached 44,639," Rudskoy said. According to the Russian Defense Ministry, the United Nations confirmed the withdrawal of refugees from Eastern Ghouta, carried out in line with international law. There have been no military actions in Syria's Eastern Ghouta region in the past seven days; most of the region is controlled by Damascus, Col. Gen. Sergei Rudskoy stated. "The Russian Reconciliation Center and Syrian authorities are carrying out an unprecedentedly large-scale humanitarian operation in the suburban Damascus region of Eastern Ghouta," the official added. The situation in Eastern Ghouta has been tense over the past months, with militants in the region and Syrian pro-government forces exchanging constant fire. The Syrian government says it opens fire in response to shelling from Eastern Ghouta, but Western countries are accusing the Syrian government and Russia of being responsible for the intensification of tensions in the area. Militants in Syria are further attempting to carry out provocations with the use of chemical weapons in order to blame Damascus for chemical attacks on civilians, Sergei Rudskoy said Saturday. "I want to draw your attention to the ongoing attempts of the militants to carry out provocations with the use of poisoning substances to accuse government troops of using chemical weapons against the local population," Rudskoy said. Erdogan Vows to Eliminate PKK, YPG, PYD, Urges US to Refrain From Provocations: "Ankara Won't Put Up With It for Long"
He added that the US instructors had prepared several groups of militants at a camp near the city of al Tanf to carry out provocations with the use of chemical weapons. According to Rudskoy, the toxic agents have been delivered to southern Syria under the guise of a humanitarian aid convoy. He added that 20 containers with chlorine were delivered to settlements located 25 kilometers (15 miles) to northwest of Idlib, with Nusra Front* terrorists preparing an attack in the area. Rudskoy noted that the provocations were also aimed at creating a pretext for US strikes against the Syrian government.